Just over a year later, Warner Home Video’s first PG-13 animated Superman movie has been re-released as a Two-Disc Special Edition! Superman Doomsday is not only a fun, action-packed animated movie, but also shows just how edgy and even twisted Superman can be. Sure, the film may not be perfect, but it’s a fun little trip to have. With Bruce Timm and Duane Capizzi overseeing the project, it’s no wonder that the film has an emotional core to go along with the very bloody action. And yes, there’s plenty of blood. Let’s cut to the chase and get to the synopsis, shall we? 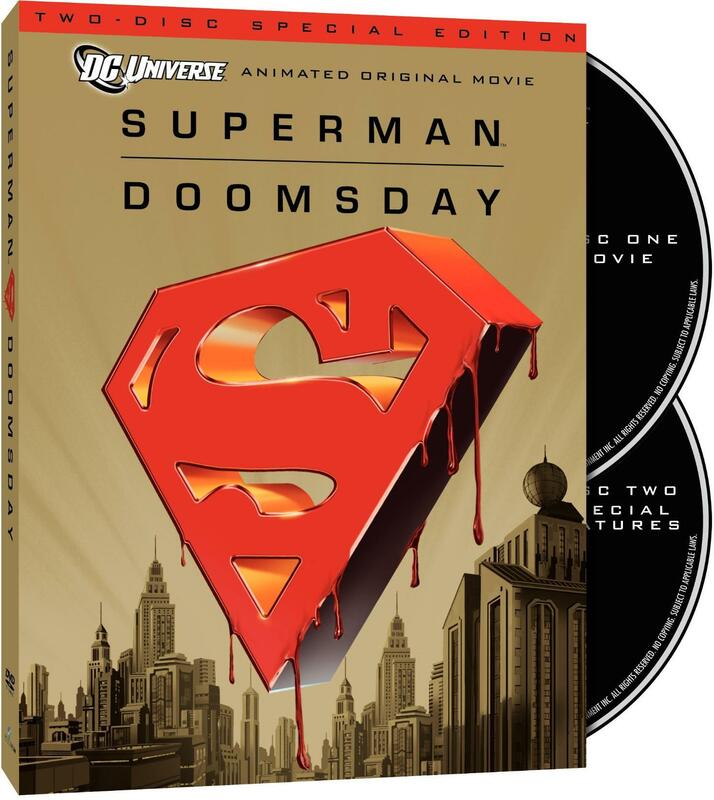 Warner Home Video has released a new Two-Disc Special Edition release of Superman Doomsday on DVD and, well, it’s an eye-catching release, to say the least. So, with fans wondering whether or not to pick up this new release, let’s start on the outside and work our way in. So, how’s the packaging? Well, the packaging is pretty nice, actually. The release is housed in the standard Amaray two-disc package covered in a gold and red foil cardboard slipcase. There are no inserts, however. Once we get inside, things are basically the same for a few slight cosmetic changes here and there for the overall menu and extras set-up, but before I get to that, let’s check out the extras. The extras for the first disc are the same ones we got first time around, so let’s go through them quickly. The first disc starts off with the same great commentary as the last Superman Doomsday DVD, one of the best to grace a DC Animated release. The commentary is a full house, featuring Timm, Capizzi, Romano, Gregory Noveck, Brandon Vietti, and Lauren Montgomery. It’s a full commentary, and an engaging one, at that. There seemed to be a great dynamic amongst the group, and I was glad that the majority of the participants really got face time in here. While Timm, Capizzi, and Romano certainly ruled the roost here, the other participants were able to squeak in here and there, specifically Montgomery (who was responsible for the greats second act to Superman Doomsday). I can’t say it’s the best commentary I’ve heard on a DC Animated release, that still belongs to the unedited Batman Beyond: Return of the Joker commentary, but it’s a lively one. Plus, it’s great to hear Capizzi and Timm discuss their work together. There’s actually a few times when they don’t see eye to eye, which provides for some entertaining discussion. Next up is “Requiem & Rebirth: Superman Lives!,” an hour-long documentary about the “Death of Superman” storyline. It’s a great and incredibly detailed look at the whole process, from start to finish, of killing Superman. It’s great to see the major artists of that era, who are still great today, interviewed for this documentary. And we see just about everyone. Jurgens, Grummet, Stern, they all seem to be there. And, surprisingly, a lot of them are still very emotional about the whole storyline. Personally, I was surprised that Superman was originally supposed to get married around this time, but, due to the horrible Lois & Clark: The New Adventures of Superman TV show, they had to buy time. So . . . well, they just killed him. Following that is the same Justice League: The New Frontier teaser reel from the last release, just labeled simply Justice League: The New Frontier here. Rounding off the first disc is a featurette on voice acting, a menu challenge (which seems very out of place), and a selection of trailers, including one for Batman: Gotham Knight. The featurette is the standard EPK, but, as always, it’s nice to get a look at those who provide the voices for the characters here. It’s well done. The second disc is full of all-new content, with a fair amount of it focused on the animated feature itself. One of my few complaints to the DC Universe releases is that fact that we get little to no information on the production of the actual animated feature, so I’m glad to see that Warner Home Video has rectified that here. First up the the half-hour “When Heroes Die: The Making of Superman Doomsday”, produced by Retrofit Films, and it provides a pretty nice look at the creation of the movie and why Warner Home Video went through with it. There’s no real new information to learn here, but the production images is great to see and the interviews nicely compliment the movie. After that is the pre-release EPK “Clash of the Juggernauts,” which is essentially a very-long sizzle reel released before Superman Doomsday hit shelves. Running over ten minutes, there’s no real information to be found, and it’s very fluffy, but completists should enjoy watching this. After that we get the standard Wonder Woman preview identical to the one featured on the Batman: Gotham Knight home video release, and four episodes of Superman: The Animated Series chosen by Bruce Timm. It’s a well put-together second disc with over two hours of new bonus content. Like I said earlier, there’s a few different things on this Superman Doomsday release than the previous. The first disc is basically an identical copy of the original Superman Doomsday release save for a few small changes. I was surprised to see that Warner Home Video even went back to the first disc and made a few slight changes to the menu. It’s nothing major, just an extra moved around on the menu listings, new trailers on the “Trailers” page and the copyright date updates. Warner Home Video could have easily just left this disc alone, but I am glad to see that they took the time to do a few updates for this new release. The audio and video is clear and sharp, appearing identical to the transfer of the previous Superman Doomsday release. The transfer is crystal clear, with no visible problems that I could notice. The widescreen transfer is simply gorgeous, and it sounds amazing. You hear every single punch and grunt, but you also hear the smaller things, too. A slight breeze. A quiet foot step. A sigh. A shuffling of papers. Everything is clear and concise. A very solid transfer and a great effort on Warner Home Video’s part. Overall, should fans pick up the new Superman Doomsday: Two-Disc Special Edition release? Well, if you don’t have the original DVD release, then I’d recommend that this is the one to pick up. But to those who own the last edition, you’ll have to ask yourself how much you want that second disc. The new content on the second disc runs roughly over two hours and there’s plenty of keep fans engaged. The new “making of” feature is interesting and shows a wealth of production art that hasn’t been seen before. Add on new interviews and you have a very solid new 30-minute feature. The EPK is also nice to have, as are the Superman: The Animated Series episodes. Personally, I’d give the new Superman Doomsday: Two-Disc Special Edition release a stamp of Highly Recommended, but with reservations. It’s a fun, action-packed movie and, with this new release, comes with over four hours of bonus content that’s sure to please any fan of the Man of Steel. 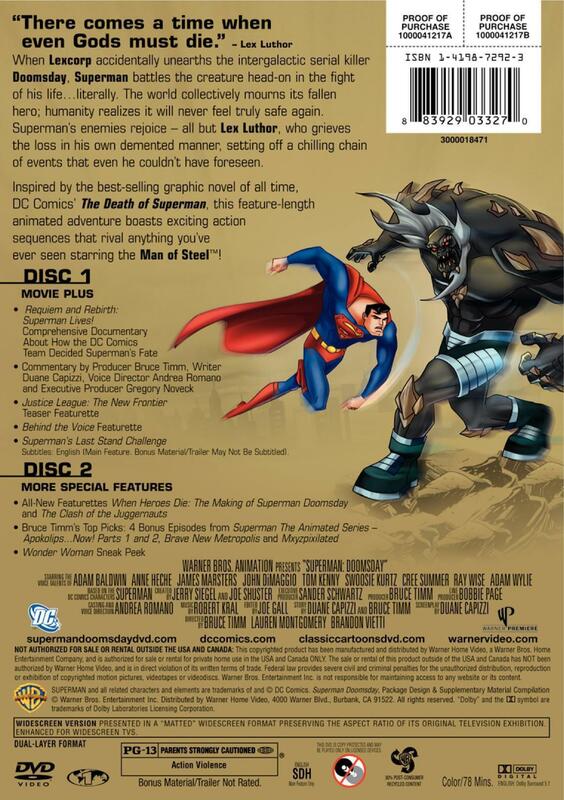 Superman Doomsday: Special Edition is now available on Two-Disc DVD and Blu-ray.